Ricky Ricotta selects the next experience for Fromage du Mois: an elegant and tasty goat's milk cheese, originally from the southeast Spanish coast. Called Murcia al Vino, and fortuitously available in the US under the pseudonym "The Drunken Goat", it features a wash in red wine as part of the production process. Curiously, the Spanish name sounds more elegant. 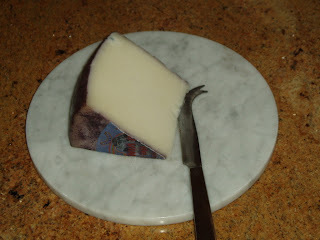 Jenkins describes the queso de murcia (the basic cheese) as a "very agreeable, moist, smooth goat's milk cheese". The incredible notion of soaking cheese in wine resulted from government pressure in 1986 on local cheesemakers to innovate a unique and delicious cheese to put Murcia on the fromage map, so to speak. This cheese was has only recently become available in the United States. As such, after a conservative start with the venerable Emmenthaler, we celebrate our first venture into the unexplored outback of cheese!